The P/O Warehouse Receiving Process can help expedite the receiving process. 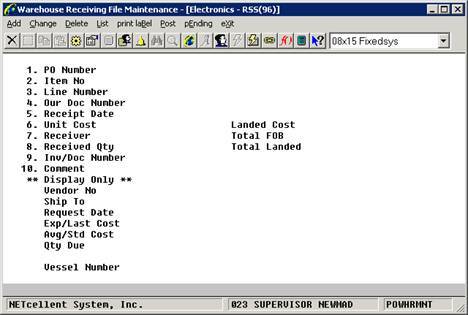 Unlike the legacy PO receiving process, the Warehouse Receiving process skips the unit-cost field and does not require the user to perform accounting distribution. The process has been designed to allow the warehouse personnel to participate in the P/O receiving process by making it easy and secure. The Warehouse Receiving process also supports scanning which makes it ideal to run on a tablet PC or light weight notebook computer with wireless access. In Elliott V7.4, both Legacy Receiving and Warehouse Receiving transaction quantities will be displayed in PO Inquiry and in the F5 window of the PO Line Item Maintenance as pending. Both can work with the Vessel file for batch control. If you change the vessel arrival date, all corresponding receiving transactions’ scheduled receiving date will be changed as well (and reflect in the ATP details). Users can enter the receiving transactions in advance and place the vessel on hold for posting. In addition to the visibility of the PO data showing on the ATP, the un-posted (on-hold) receiving transactions will now show up on the ATP to give customer service better visibility of the goods on the ocean. This On Ocean ATP information will have a much more accurate arrival date than those ATP transactions for a PO. Therefore, if you are an importer, you can consider importing the spreadsheet data provided by your overseas vendors as warehouse receiving transactions. This will give the Goods on Ocean ATP visibility to customer service. Upon the actual arrival of the container, you can let the warehouse personnel verify the already imported receiving data against the actual receiving. If it matches, then release the vessel and now you can post the warehouse receiving transactions. We believe this is a much more streamline, productive and informative receiving method. Some users have already used the Elliott Warehouse Receiving, with great success, to receive items by scanning the UPC barcodes. Typically, they will have the warehouse setup with Wi-Fi devices. Since covering the entire warehouse with Wi-Fi can be expensive, some only cover the receiving area with Wi-Fi by purchasing a single wireless router. A notebook or tablet PC is used to run Elliott in the warehouse and the users will either carry the computer with them or set it on a small cart and move around the warehouse. The barcode scanner will connect to the computer’s PS/2 or USB port by wire. For ultimate flexibility, the scanner can connect to the computer through another wireless connection. This type of scanner is typically not expensive and does not have a screen or keypad, since they are simply a keyboard wedge scanner. Keep in mind the notebook computer is not limited to run Warehouse Receiving. It can be used to run any Elliott application, like Shipping Verification, Physical Count, Inventory Transfer (especially for Multi-Bin operations) or simply Stock Status Inquiry. Throughout the Elliott application, wherever the system prompts for an item number, the user can scan the barcode item number (like the UPC, GTIN or Manufacture Item Number) and the system will convert it into the Elliott Item Number. Select Warehouse Receiving Process from the pull down P/O Processing window. This is where maintenance on warehouse receiving takes place. Transactions can be added, changed and deleted from here. Also, this menu provides the post function. Warehouse Receiving transactions must be posted from here since they are separate from the regular receiving transactions.